Autism 365 (228mph) Challenge | Racing | Eisenberg Racing - Max Your Life. Background… Imagine a road legal motorbike…powered by a Jet turbine with over 500 horsepower, traveling at over 330 feet per second… that is the distance I will be travelling along the ground at 225mph. That’s quarter of a mile every 4 seconds! Guernsey’s most successful land speed racing team ‘MADMAX race team’ has built the world’s most powerful road legal motorbike here in Guernsey, using local expertise and skills. The bike features a specially modified Rolls Royce 250-C20B turbine from an Augusta 109A, 6 seat luxury helicopter. The bike has already achieved the British land speed record in 2014 at 214mph in 1 mile from a standing start. In August 2014, it raised the top speed again to 224.9mph using a ‘naked bike’, meaning no aerodynamic aid, fairing or ability to shelter from the wind; thus achieving the World Land speed record for turbine powered motorbikes. What does that feel like? At 190mph, the extreme air resistance is literally trying to rip the helmet off my head, to such an extent, I have to strap my helmet to a climbing harness simply to keep the helmet in place. At 220mph, the vertebrae and discs in my neck are under so much pressure from the wind resistance on my helmet (over 80kg), that the pain in my neck becomes excruciating. Every ounce of my strength is required to hold on to the handlebars for the 10 second duration of full power. If that wasn’t enough stress, now I need to stop before I hit the end of the runway! For every second I procrastinate after crossing the finish line, I lose over 300ft of distance. That leaves me with 2,200ft left to go from over 225mph! One then has to factor in all the other risks. Can my rear tyre maintain grip with the massive torque created by the turbine (1200 pounds of torque at the rear tyre), without the tyre spinning up and destroying itself?. Can I fight the cross winds, which at just 10mph, can be exponentially powerful at 200mph plus? Can I even hold on long enough? This is precisely why I’ve been in the gym weight training since Aug 2014; to increase grip, upper body and neck strength to cope with the extreme forces at such high speeds. If you’ve got this far, you’re probably asking, ‘why would anyone want to do something so dangerous?’ Firstly, we have built the most amazing technologically advanced motorbike here in Guernsey, one which has captured the hearts and minds of young and old alike, and ignited a passion for engineering, whilst demonstrating to the world how Guernsey consistently raises the bar. Secondly and most importantly, Aspergers (an Autism Spectrum condition) exists in my family. ASD kids are unique, often brilliantly intelligent, but simply view and experience the world in a different way. Many of the greatest minds in history and contemporary business alike are on the spectrum, and I believe this should be celebrated. 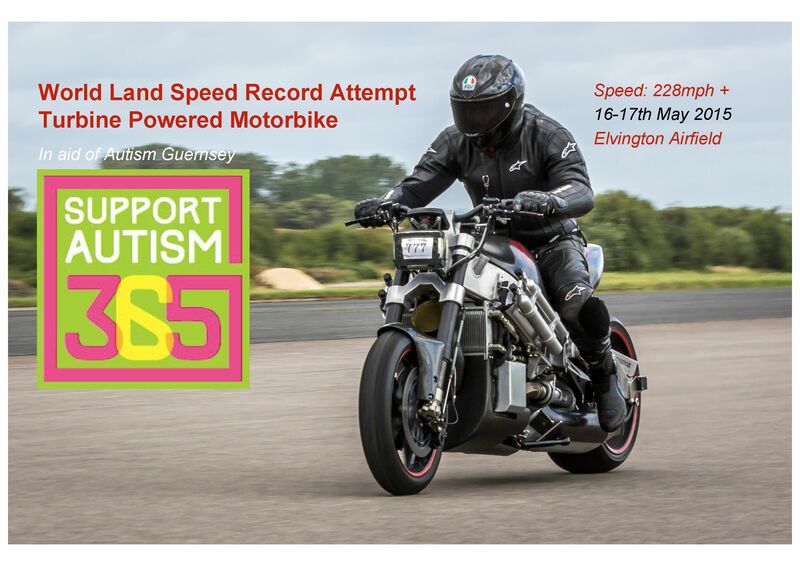 My Land Speed Record ‘Autism 365kmh’ is my way of raising awareness for this important cause. Some of you may have figured out that 365kmh converts to 228mph, which if I can exceed, such a speed, will be a NEW WORLD land speed record for turbine bike powered motorbikes. The bike will wear the ‘Autism 365’ logo and fly the Guernsey flag with pride, to ensure maximum awareness. I am risking my life to bring a new world record back to Guernsey, in aid of what I feel is an incredibly valuable charity and service. In light of this, please dig deep and give generously and you’ll be rewarded with everything my team and I have in our box of tricks, to deliver a new world record in association with Autism 365! Where & When? The World Land Speed Record for Turbine powered motorbikes attempt will take place on May 16-17th 2015 in Yorkshire at Elvington Airfield (the 1.9mile long WW2 runway 26) and will be fully accredited by the ACU, UKTA and British Speed Record Club. After raising the speed of the motorbike from 224.9mph last August to 225.6mph on the first run of the day, the speeds started to get hard, real hard with strong cross wind gusts, and every 1mph increase feeling near impossible, due to the intense wind resistance at that speed with no fairing at all. The physical pain in holding on, was intense with the ‘upright bars’ and arms out position acting like a parachute. By the end of the day, the 228mph top speed goal had still alluded us. By 5pm, it was time for food and thought. The team spent the whole evening looking at the motorbike datalogger to see where we could make improvements. We worked out we needed another 100hp to gain just another 6-7mph, as the drag on the bike is about 0.9 Cd which is about 3 times that of a sports fairing bike like a Suzuki Hayabusa, which has a drag of around 0.35 Cd. We decided we would go all out and increase the fuel flow on the turbine to maximum and increase the water-methanol cooling to max flow also. The safety parameters were raised to the limit (auto-cut out on the turbine) to ensure we had maximum power, with safety still. Sunday started with strong winds and slight rain, but we were not perturbed, as the bike was now set up perfectly for the conditions. The speeds started to climb frustratingly slowly. I explained to the team, that we cannot go back to Guernsey without a top speed of 228mph +, as that is what I have set the challenge for with Autism 365 and promised all the generous people that have sponsored me. So we decided it’s going to be an all or nothing next run… I literally held on with every ounce of strength and held that throttle on full, to push out an amazing new top speed of 231.5mph with an upright Streetfighter bike, with no fairing and MX style bars! I can’t tell you how relieved we all felt. We now felt confident. The bike was handling superb, like a turbine powered bullet train. The data logger and torque sensors were showing levels around 480lbft at the turbine, regular spikes of 1100lbft at the rear tyre and 542hp, which interestingly is over 100hp more than last August’s Top speed event, where we set a top speed of 224.9mph. The laws of physics needing eight times the horsepower for double the speed was never more true. We then decided to change the ‘upright’ bars to ‘clips on’ to get ones self out of the wind more. This allowed me to achieve a best ever (world) one way top speed for a Turbine bike @ 233.7mph. and this is all with a road legal motorbike (lights, indicators, reg plate, etc..) that consumes regular pump Diesel and uses road legal tyres, no slicks or tyre warmers are used!